Intuit Executive Board Chairman Brad Smith speaks as Marshall University hosts a kick-off ceremony for its new Brad D. Smith Business Incubator on Tuesday at the university’s Visual Arts Center in downtown Huntington. HUNTINGTON, W,Va, — The Marshall University Visual Arts Center in downtown Huntington is adding one more thing that is being created inside its walls — small businesses. On Tuesday, the university announced the creation of the Brad D. Smith Business Incubator, a partnership between Marshall’s Brad D. Smith Schools of Business and Robert C. Byrd Institute (RCBI). 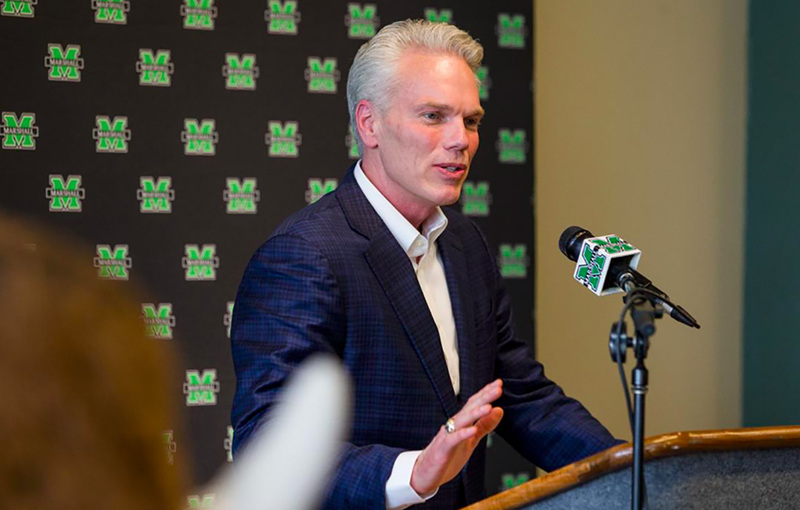 Named for Brad Smith, a Marshall alumnus and benefactor who serves as executive board chairman of Intuit and chairman of Nordstrom, the goal of the incubator is to offer mentorship and support to early-stage startups.